Nanotechnology Now - Press Release: Amazingly 'green' synthesis method for high-tech dyes: Dyes that are also of great interest for organic electronics have recently been prepared and crystallised at TU Wien. All that is required is just water, albeit under highly unusual conditions. 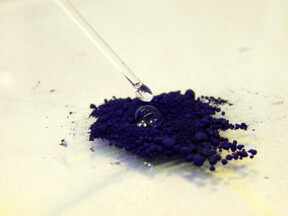 Home > Press > Amazingly 'green' synthesis method for high-tech dyes: Dyes that are also of great interest for organic electronics have recently been prepared and crystallised at TU Wien. All that is required is just water, albeit under highly unusual conditions. They not only impress due to their radiant and intense colour, they also have an important technological significance: organic dyes are a class of materials with extremely special properties. From flat screens to electronic paper through to chip cards: in future, many technologies are likely to be based on organic molecules like these. Amazingly 'green' synthesis method for high-tech dyes: Dyes that are also of great interest for organic electronics have recently been prepared and crystallised at TU Wien. All that is required is just water, albeit under highly unusual conditions. Previously, such materials could only be prepared using complex synthesis methods that are incredibly harmful to the environment. However, researchers at TU Wien have now successfully synthesized several typical representatives of this materials class in an entirely new and different way: toxic solvents have been replaced by plain water. But how is this done? When water is heated to extremely high temperatures, its properties change significantly. Details of the new preparation method recently published in the prestigious scientific journal Angewandte Chemie. "If you were to listen to your initial gut feeling, you would actually suspect that water is the worst solvent imaginable for synthesising and crystallising these molecules," says Miriam Unterlass from the Institute of Materials Chemistry at TU Wien. "The reason for this expectation is that the dyes we produce are extremely water-repellent." If you, for example, drop a small droplet of water on some dry dye powder, the droplet just rolls off. The dye cannot be mixed with water. But this behaviour only applies to water as we know it from everyday use. However, the researchers at TU Wien used water heated to at least 180°C in special pressure vessels. Under these conditions, pressure rises drastically, so that the majority of water remains liquid despite the elevated temperatures. The chemical and physical properties of water change drastically under these conditions. "The properties of cold, liquid water are strongly influenced by what is known as hydrogen bonding," explains Miriam Unterlass. "These are weak bonds between water molecules that are constantly broken and reformed." On average, each water molecule is linked to three or four other water molecules at any time at room temperature. In a pressure cooker, the number of these hydrogen bonds per molecule decreases. "This also means that many more ions are present in water at high temperatures than under standard conditions - a certain amount of H2O molecules can become H3O+ or OH-," explains Miriam Unterlass. And this dramatically changes the properties of the water: in a certain sense, it behaves like an acid and a base at the same time - it can act both as an acidic and a basic catalyst and therefore accelerate certain reactions or even enable them in the first place. Amongst other things, the higher number of ions in the water at elevated temperatures is a key cause for allowing the dissolution of organic substances that are entirely insoluble under normal conditions. Consequently, the dye molecules studied can not only be synthesised in water, but also crystallised: they dissolve at sufficiently high temperatures and then crystallise as they cool down. "Normally, toxic solvents are needed to prepare or crystallise such dyes. In our case, though, pure water adopts the desired solvent properties - all you need is pressure and heat," says Miriam Unterlass. "In a highly crystalline state - i.e. at a high degree of order at the molecular level - the electronic properties of these materials improve. It is therefore particularly important for applications in organic electronics to have a high level of control over the crystallisation process," stresses Unterlass. For the crystals obtained, however, there are also some quite different potential applications. "They can be used wherever the requirements for dyes are rather demanding", says Unterlass. "One such application would be car paint, or other areas where extreme chemical or thermal conditions prevail, as the materials also become more stable the more crystalline they are."